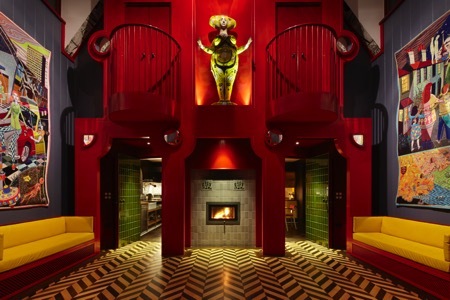 Contemporary artist Grayson Perry’s designer building is a gloriously absurd secular chapel paying homage to the memory of Perry’s fictional Essex woman, Julie May Cope. Unique, slightly unsettling, but certainly moving, it’s a much oversubscribed holiday destination. 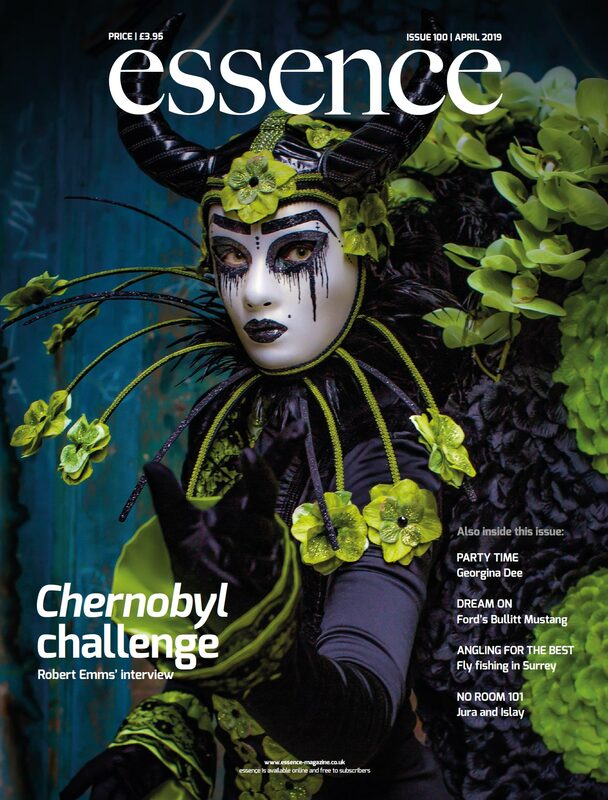 Emily Bird investigates a phenomena in the small village of Wrabness. Living Architecture’s aim is to shift the perceptions of modern architecture by allowing people to eat, sleep and live in spaces designed by outstanding architectural practices. 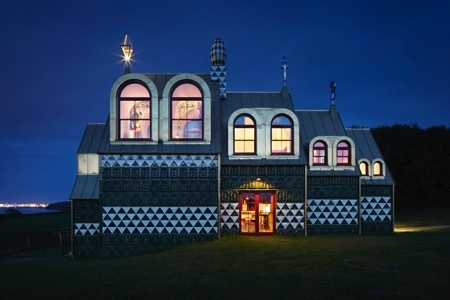 With many properties dotted throughout the UK, there is a selection of unique buildings to stay in, but no project has been quite as attention grabbing as Grayson Perry’s and FAT Architecture’s A House for Essex which is the architectural embodiment of the noted artist’s daring talent. Born in Chelmsford, Grayson Perry is one of the UK’s leading contemporary artists and winner of the coveted Turner Prize in 2003. Going on to achieve huge critical and popular acclaim, he specialises in ceramic pots, tapestries and sculptures and has also curated a series of high profile exhibitions around the globe. An icon in popular culture due to his eccentric attire, Grayson Perry is celebrated by art lovers and critics alike and his project for Living Architecture enables fans to immerse themselves in his art. FAT Architecture has been one of the most challenging and provocative voices in UK architecture during the last two decades and embraces decoration, ornament and explicit communication in its designs, making FAT the perfect pairing for the artist on this project. Conceived as a landmark in the tradition of wayside and pilgrimage chapels, A House for Essex is dedicated to a saint of Perry’s creation, Julie May Cope, and gives architectural expression to her life. Described by the artist as an ‘Essex Everywoman’, a working-class woman who went with the default settings of her generation, such as choosing marriage over education, but who had a redemptive second act. Julie’s image is visible throughout the house and the artist’s handmade pots and tapestries depict her colourful life. Looming over it all is the motor scooter that killed her: running over her whilst delivering a curry. Charles Holland of FAT Architecture describes the space as a radical statement about architecture and its capacity for narrative and communication to tell a rich and complex story. The house itself is reminiscent of a Russian doll with a series of archetypal house shapes that step up in scale as it descends the hill. Built around a striking decorative object which is part medieval rood screen, part baroque façade, it frames a ceramic statue of Julie Cope. The two bedrooms include walk through cupboards leading to internal balconies overlooking the chapel space below and benefit from views to both the east and west. The exterior of the property is the building’s tour de force clad with more than 1,900 green and white ceramic tiles cast from originals made by Perry depicting Julie as a mother and icon, along with symbols associated with her life. A House for Essex is available to rent on a short-term holiday basis and can sleep up to four people. Due to the extremely high demand for this property, holidays are sold via a ballot open at various points throughout the year offering the chance to purchase a two to three night stay. You can register for newsletter alerts for future ballots via the Living Architecture website. Profile FAT (Fashion, Architecture, Taste) is an architecture studio with an international reputation for delivering outstanding and award winning projects. Specialising in architecture, cities and design, the company works for cultural, commercial and government clients including Igloo Regeneration, BioRegional/Quintain, Tate, Grosvenor, Selfridges and Rotterdam City Council and is committed to developing client briefs into extraordinary projects. FAT is directed by three of Britain’s leading architectural and design figures, Sean Griffiths, Charles Holland and Sam Jacob, all committed to developing architectural culture both through practice and design research at institutions including Yale and the Architectural Association. The directors are closely involved in the design of all projects which are managed by a project architect or leader in close contact with the client. Current projects include the BBC Media Village in Cardiff, The International School, Birmingham, residential schemes in Sheffield and Middlesborough and an art academy in Eindhoven. Recent projects include a library in south east London, a cultural centre and park in Rotterdam and a new build mixed use development in Amersfoort, Netherlands.